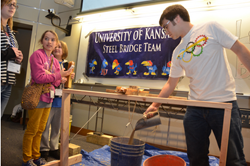 LAWRENCE — A century-old tradition showcasing the wonders of engineering returns to the University of Kansas this week. The Engineering Expo will run from Feb. 19-21, at the Engineering Complex, 15th and Naismith Drive. The three-day event features competitions and displays that provide thousands of K-12 students from the region with an opportunity to see the practical applications of engineering. This year’s theme, Engineering Hollywood: Scripting Our Future, draws parallels between the magic of the silver screen and the wonders of engineering. Day one of Expo, Thursday, focuses on middle school students. Friday is geared toward grade school and high school students, and Saturday is open to the public. From constructing sturdy skyscrapers from popsicle sticks to launching rockets propelled by water, both Thursday and Friday feature the same competitions, which test engineering skill while demonstrating how fun engineering can be. Awards will be presented in all 12 competitions. In addition to the competitions, there’s an opportunity to participate in dozens of hands-on activities. 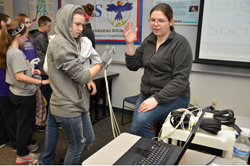 Susan Williams, professor of chemical and petroleum engineering and director of KU’s Biodiesel Initiative, will speak on Feb. 19 to middle school students attending Expo. Steve Hawley, professor of physics and astronomy and former astronaut, will deliver the keynote address for high school students Feb. 20. Hawley also leads KU’s Engineering Physics degree program. Both presentations are at the Lied Center. The hour-by-hour schedule is here. All events are free; however, teachers planning a visit with their classrooms should register in advance. Saturday events run from 9 a.m. to noon. Parking is available for in lot 54 immediately south of Eaton Hall. Saturday visitors should be aware that parking lots will close to the public at noon for the KU vs. TCU men’s basketball game, so be sure to remove vehicles by that time. A parking map is available here.